Electric transient phenomena associated with circuits containing capacitors and resistors (CR circuits) are important from theoretical as well as practical point of view and they find place in the AP Physics C course. Transient phenomena associated with circuits containing inductors and resistors (LR circuits) are not as important as those associated with CR circuits but you should not ignore them. Today we will discuss some multiple choice practice questions in this section. It will be a good idea to get yourself equipped sufficiently for the exercise by referring to my post dated 31 March 2008 on this site. (1) In the circuit shown the the battery has emf E and internal resistance r. The switch S is closed at time t = 0. If the voltage across the capacitor is 90% of the emf E of the battery after time t’, what is the value of t’? Q =Q0 (1– e–t/RC) where Q0 is the final (maximum) charge and ‘e’ is the base of natural logarithms. V =V0 (1– e–t/RC) where V0 is the final (maximum) voltage which is the emf E of the battery. 0.9 E = E[1– e–t’/(R+r)C] since the total resistance in the circuit is R+r. 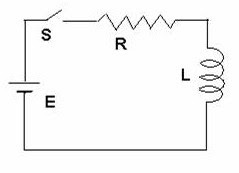 (2) The adjoining figure shows a resistance R connected in series with an inductance L and a battery of emf E through a switch S. The internal resistance of the battery is negligible. 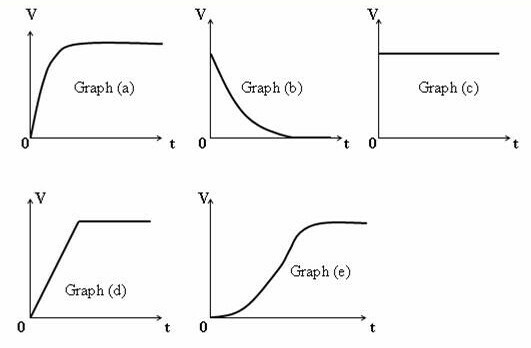 Which one of following graphs represents the nature of variation of the potential drop V across the resistance with time? This shows that the current at time t = 0 (immediately after closing the switch) is zero. As time t increases, the current increases exponentially and reaches the final maximum value I0 (= E/R) when t becomes infinite. 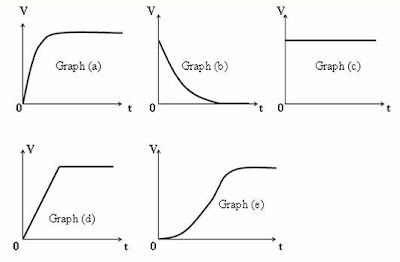 As V = IR the potential drop V across R also increases exponentially with time as indicated by graph (a). 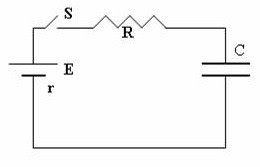 (3) A capacitor C charged to V0 volt is discharged through the series combination of two resistances R ohm and 2R ohm by closing the switch S (Fig.). The base of natural logarithms is e. What is the current in the circuit when 3RC seconds are elapsed after closing the switch S? The time constant of the circuit is 3RC and hence the voltage across the capacitor after 3RC seconds must be V0/e. You can write this if you remember how the time constant of an ‘RC circuit’ is defined. The discharge current at this instant is equal to (V0/e)/(3R) = V0/(3Re). The negative sign just shows that the discharge current is opposite to the charging current. Ignoring the negative sign, the discharge current when t = 3RC is Q0/3RCe. But Q0/C = V0, the initial voltage across the capacitor. This is a very simple question. But some of you will have some doubts. Initially the voltage across the capacitor is V0 and the total resistance connected across this voltage is 3R. Therefore, voltage drop across the resistor of value R must be V0/3. I0 = dQ/dt = – (Q0/3RC) e0, appropriate to t = 0. The initial voltage across R is I0R = V0/3]. Is there a correct answer to the the 3rd question? How can current have units of V/3RCe? This is V/s. In your derivation, when evaluating Q/3RC, the expression goes to V/3R, NOT V/3RC, if substituting C=Q/V. The discharge current I at time t =3RC is given by I = Q0/3RCe = V0/3Re since Q0/C = V0, the initial voltage across the capacitor. The extra C was a typing error which I have corrected already. Thank you very much Steve Kabach.